Everything you need to know about cleaning a flute. Tarnish control; links to flute cleaning videos; caring for a flute. I want to know how to clean my flute. I know how to clean it , but I want that my flute to be very clean can you please to answer me. If you want a flute that's VERY clean, you must take it to a flute repair person and they will properly clean it for you (remove all the moving parts, clean each part individually, take all tarnish off, and re-oil all the moving parts before reassembling). It is normal for a flute to be oiled once a year, so the cleaning can be done at this time. The cost of a C.O.A. (clean-oil-adjust) is about $60 to $100 a year. This is part of the normal cost of maintaining a working flute. Ask your flute teacher who they recommend to do this work. 1. You can wipe the flute very gently with a micro-fibre polishing cloth. These are light blue and sold in most hardware stores and music shops. They're lint-free and wick up oil and fingerprints. This is a cosmetic cleaning only, just for keeping the fingerprints and caked-on grunge to a minimum. Over zealous (too hard) cleaning can lead to problems. Thin gold plating on a lip-plate can be wiped off over time, so be careful. 2. Wipe the headjoint with isopropyl alcohol if you want to sterilize it between players. The alcohol is also called "rubbing alcohol" and is very cheap at the drugstore. You can also use a Q-tip dipped in alcohol to very gently clean the inside of the headjoint's blow-hole, if it has grunge buildup inside; but be very gentle, and don't dent or scar the blowhole at all. A small $3 bottle of isopropyl is also handy to have for removing adhesive from stickers used to line up the headjoint, and clean off skin oils to make new stickers adhere more firmly. It's use on a flute's lip plate is simply to kill germs if the flute is being played by several children, or unknown former flute-testers. 3. If the flute is used, old, has tarnish, and hasn't been for a "clean, oil and adjust" yet, take it to a reputable flute repair technician. Flutes that do not go in for repair once a year can slow down the young player's development, as flutes normally develop leaks in the pads through wear and tear and general use. Flutes also have a complex set of mechanical adjustments to keep multiple keys closing together precisely. Playing a flute that unbeknownst to the student, happens to have a pad leaking, forces the student to gradually press harder on one or more of the keys to make the notes sound well. This in turn slows down the student's progress, and can lead to eventual hand and arm strain. Special lubricating oil in the moving parts (applied by a qualified technician) is required once a year to keep the flute in good mechanical shape. Lack of oil causes wear in the finely machined connections in the mechanic, and can eventually lead to slop or "play" in the mechanism. Make sure the parents understand that annual maintenance visits are part of owning a flute. Avoid WASHING the flute. Running water over a headjoint can eventually shrink/saturate the cork (inside headjoint) and water is very bad for the pads. Avoid using household silver polish; it removes too much silver plating, and gums up the moving parts, as well as creates sticky noises from off-gassing onto pad surfaces. A chemically treated flute polishing cloth (made to remove tarnish) is to be used minimally; once a year at most. A trained flute technician (flute repair-person) will fully clean and service a flute inexpensively and correct any mechanical adjustments. Ask your private flute teacher for recommendations for a reliable technician. Dear Jen, we bought an Artley flute for our grandaughter, and I have been reading over what you say about how to clean it up for her, but my question is: Are we to understand that once a flute is tarnished you're not supposed to use silver polish or TarnX, etc. to bring back a shine? Answer: Here's the thing about tarnish; it's NORMAL to have a slight patina of brown/black or gold coloured tarnish on a flute. There's no realistic way to stay 100% tarnish-free. Professional full time flutists usually have tarnish all over their flutes if you look closely. I saw for myself how Jean Pierre Rampal (world-class flute player from 1950-1970s) had a flute that was almost completely pitch black, especially between the keys. Same with London Symphony Principal flutist Paul Edmund Davies; black flutes. Some people have too much acid in their skin and tarnish a flute within weeks just by touching it. Others, like me, do not tarnish their flutes very quickly, but the flute tarnishes by itself just through oxidation and time. Additionally: most of the darkest tarnish occurs where you cannot safely or easily reach it, between the keys. There is no way for the flute player to clean between the keys and remove tarnish without taking it to a flute technician and have them remove all the moving parts and dip the body in silver cleaner. And if you try to be all handy and take the keys and mechanism off yourself, you're in for a horrible surprise; you can't put it back together and have all the pads still meet all the tone holes to make it playable. This takes years of training. - the between-the-keys area will still be black because you can't reach them. - since the mechanism's enemy is fibres or fuzz, it's very bad to have any loose fibres or fuzz collecting near the mechanism (as left behind by lint cloths or Q-tips.) See videos below. - the silver cleaning chemicals are slowly, invisibly able to eat through the flute's pad membranes, causing pad leaks which cost about $50+ per pad for replacement pads. Any chemical off-gassing onto the pad surfaces lead to necessary pad replacements, just from closing the lid on a flute that is offgassing silver polish. - silver cleaning chemicals also can leave a sticky residue on pads, which leads to keys sticking down, and making noises as they open and close. This also leads to eventually having to replace all the pads to get rid of the "tick tack" noises. - the silver cleaning chemicals can work their way into the inside of the moving parts and remove the metal from the inside of the tiny tubes and levers. Over time this can remove layers of metal, creating "play" in the mechanism as it wears from the inside out. What you really want to do is protect the inside of the rods from being worn out. So, leave it to the professionals who know what they're doing. Have the flute professionally cleaned by a reputable repair person (ask the flute teachers in town which shop is best) and then later put 3M anti-tarnish strips inside the case to absorb future sulfur gases, so that the flute does not tarnish as quickly NEXT time. It will stay white-silver-coloured for about 3-10 months depending on how much sulfur you have in your environment. To reduce tarnish, keep the flute in its case whenever it's not in use. But remember Tarnish is NORMAL, and professional flutists have tarnish all over their flutes until their once-per-year or twice-per-year cleaning. Students are the only people who seem to want shiny white-silver flutes. But to keep a flute in that condition you'd have to seal it away and never play it. So, the student, once studying with a real flute teacher, soon gives up that notion, especially when they see what a professional flute looks like when it's played 3-8 hrs. a day, and tarnish cannot be controlled when that's going on. Anti-tarnish 3M strips are about $6 for a ten year supply at Fluteworld. What your grandaughter REALLY needs is a flute teacher to help her understand these things. A used Artley flute, or any used older flute, MUST go to repair before the student starts to use it. This is KEY to the whole process. I'm not just trying to put money into the flute repair person's pocket. As a flute teacher, the saddest thing I see every September is a new student trying to play a flute that is malfunctioning, because no new flute player seems to know that the instrument needs to go to repair once a year at the minimum. What happens then is we send it to repair (because it is unplayable in its current condition) and the flute student ends up not having it for 2-3 weeks, and falling behind at flute lessons and at school because the repair shops are all backed up in September, and they can't seem to find a replacement flute. What a frustrating way to start the first flute lesson: three missed lessons because flute is at the shop! So I suggest that you jump the queue and take your student flute into the repair shop for a Clean/Oil/Adjust now (! ), and don't wait until September. Especially if it's for a beginner who's never played before. They have to start on a working flute! When the flute comes back from the repair shop it will look white, shiny, and like new for about $80 or so, which is a mandatory expense annually anyway. You can't play on a flute that doesn't fully work properly; Despite what it looks like, it's all in how it WORKS. Non-musicians usually go by looks (they see the silver like "jewelry" but remember a flute is created out of sound-creating silver, not a decorative silver to be looked at). Real musicians actually judge by mechanical action and stability, not by looks. How to assemble your flute to avoid repair problems in future. Um, i have a question. I got a geminhardt flute this summer, to start band. My flute gets quite fingerprtint-y, and grime-y. I clean the outside of it after i play, but it only stays grime free for 2 days? is there nany way to clean it by myself, at home? Scroll up and read no. 1 above. Micro-fibre (light blue) cleaning cloth takes off fingerprints. Cost is about $5 in a music store. I haven't played my flute for over two years and it is getting rusty. I didn't know the right way to clean it so I just wiped it with a t-shirt. Now I know it is wrong. My question is how much will it cost to have it all cleaned again? c)whether you just want it cleaned or you want it in tip-top working order. Why not just call up the local flute teacher (the best one) and ask for the name and number of the most reputable repair person, and then call them for an estimate visit. Who knows, you could be looking at only $40. Question. I just got my geminhardt flute off Craigslist for $80, and it has ALOT of tarnish ider or in-between the keys. Im not sure how to clean it, and we can't afford for the professional's to do it. Help? A professional "clean, oil and adjust" is absolutely manditory because of the "oil and adjust" part. You can't play a flute easily unless all the adjustments have been made by a trained flute repair person. So you'll have to raise about $50 to $80 (or more if pads need to be replaced) by some of the typical "poor flute student" methods like babysitting, car-washing, dog-walking, garage cleaning" method. Why? Because you can't clean tarnish using household silver cleaners and you can't clean under the keywork without removing the keys, which protects the moving parts from being dipped in acid-baths that the repair people use to clean the tube. So, it's up to you. You can play a flute that's tarnished and has no oil, and possibly is very hard to play, or you can raise the funds to have it properly serviced. d) if left with no oil in the moving parts (which is far more important than removing tarnish) the flute will wear out the tight fit of its mechanical parts, and will start to break down from lack of lubrication. We all try and save money when we're on tight budgets, but this is not an option when it comes to making a used ebay flute playable. Good luck and please don't damage the flute by trying to clean under the mechanism; it's simply not possible to do. The pads are just fine, I had it taken to a music dealer and appraised, he said the pads were in perfect working order and looked brand new, and there is no damage to the flute. The spots look like a light scorch mark would look like, faint and light brown, all over the flute. (I havn't touched it in 4 years, or taken it out of it's case). What brand of polish can I buy to remove these stains? I think the flute is made of regular metal, or has more metal than silver. Like I said, I'm not looking to have it repaired or oiled, just looking good enough to sell. The "brown spots" you mention are from normal household air seeping into the flute case, during its four years of storage, and creating tarnish. Silver tarnish starts as copper coloured, and then progresses through brown to black. There is no possible way to remove this tarnish and NOT get silver polish on the flute's pads. If you do use silver polish, and it gradually travels to the flute's pads they will make sticky noises (click, click, click) for the next person who plays this flute. However since it is only $120 flute, that will be the least of its problems. So its up to you what you do about it. I merely want to advise people who really care about their flutes ability to play mechanically well over time not to ever use silver polish. Ask any flute repair person; flute owners cannot use silver polish and NOT wreck the flute's pads. A flute is cleaned by a repair person who removes the mechanical moving parts to clean the tube. Any other method simply isn't worth it. I just got a new solid silver flute a week ago. I wipe of the fingerprints with the 'blue cloth' but i forgot to do so yesterday. NOw i cant rub them off! its like they are engraved into the headjoint. Any ideas? Have you tried dampening the cloth? Have you tried isopropyl alcohol? b) the flute has a kind of unusual finish on it that doesn't resist corrosion. i've got tarnish(i think) it looks like grenish - brownish ans is starting to appear all over my flute. i got it used so i guess this makes sense. my question is, if i go in to get it cleaned-will the spots definately go away? If it's a good quality flute, the spots are tarnish, and they are reminding you to go for your yearly "Clean, Oil and Adjust". During the annual maintenance visit the skilled flute technician removes tarnish, checks the pads for wear, tweaks the mechanism back into balance, and most importantly OILS the moving parts. Without this oil the flute will become too dry and will score the interior metal of the moving parts. So let the tarnish be your reminder to get this all important oil. Keeping the flute in its case, with anti-tarnish strips, will slow tarnish buildup. Leaving the flute out will hasten tarnish buildup. If the flute is really cheap, the cleaning might not help. Some under $150 cheapo flutes have such thin silver plating that it completely wears off where your hands touch it, showing the cheaper metals underneathe. What brand of flute is it? Has it had its annual cleaning? Your technician will tell you what's going on with it. Is there was a way to get rid of slops in the keys? When you say "slops", do you mean that the keys can be shifted a few millimeters from side to side? If so that's called "play in the mechanism" and can only be truly fixed by a qualified flute repair person. If you have another definition for "slops" please define. After reading through your comments, I know I need to take my daughter's flute in for a thorough cleaning. But here's my question... a neighbor gave my daughter her old flute, but it has a bad "taste" and smell from being stored for so many years. Will a professional cleaner be able to get rid of that, or is it now part of the flute? Is there anything we can do at home to rid the flute of this taste? It depends what the smell is like. If the smell is strongly of brass then the flute is likely to be made of brass tubes plated with nickel silver. If the headjoint end that inserts is brass-yellow coloured on a silver plated flute, then it is a plated brass flute (Artley, Bundy, other band flutes made to stand up to great wear and tear). A flute repair person will remove all the moving parts, an dip the tube in a special light-acid bath to remove tarnish and improve the smell of the old brass. Or, if the smell is caused by the last owner putting the flute away wet all the time, then storing it wet for several years, the bad smell could be old fungus or mildew inside headjoint (use a flashlight down the blow-hole opening to see if there's corroded look "crud" at the crown end of the blow hole.) This will also be cleaned out properly in the repair shop, and the cork replaced in the crown with a new one. A sweet-sickly smell that comes from the case itself, or from the underside of the keys where the yellow pads will show pin-pricks of insect damage is caused by the numerous worms and bugs that feed on wood, cotton and old fabric. If the case is too infested, a new case can usually be found, inexpensively, at a flute repair shop where it will be re-blocked to fit this flute. Don't use a case in which the flute is either compressed or too loose. It must fit correctly. The repair shop and full cleaning is necessary regardless of the odour. No old flute stored for any length of time should be played until it has been cleaned, oiled and adjusted. You can pour a small amount of isopropyl alcohol ($3 at drugstore) into the headjoint to try and destroy a faint odour. But this is only true of the headjoint, where there are no alcohol sensitive substances in the tube. You can't use alcohol on the middle or footjoint because it's bad for the pads, the various glues, shellacs and the oil in the moving parts. So sterilizing the headjoint this way can be a temprorary fix for a smell, but if the odour permeates the entire flute, then cleaning the headjoint alone will only work for a short time. Moral: Get the instrument professionally cleaned. It is not expensive and is necessary in order to keep the flute playing easily and well. hi my name is carly and i just got a flute and its horrible ! my bestfriend got a brand new one but mines at least 12 yrs. old ! its not working on E,D,sometimes C and a few others but its horrible because i can play all of the notes perfectly but u can't hear most of them ! I've noticed about 95 scars on the flute too. And on one of the buttons its golden (tarnished). I have a concert coming up in a few days and i need my flute to work fast without getting a professinal. Luckily next year im getting a diffrent flute, do you have tips on picking a good used flute ? Hi Jen, how do you clean the inside of a curved headjoint? Obviously the cleaning rod is straight! And I'm just talking of the daily cleaning of moisture after playing it each time. Many thanks. I had a curved headjoint from flutelab.com that came with a fluffy wire cleaner that bent easily around the curve. I don't know where to get these but they look like one-inch wide pipe cleaners. I have a question... Emerson flute sterling silver that I just bought for $1000 that is brand new.... I wipe it with the blue cloth every time I pay, but after a second, fingerprints are on it the second I touch it.... It's really hard to get it off, and I dont want to rub too hard, but everybody, including my flute teacher, is saying I'm not taking care of it and I need to clean it...... I really need help.. I've heard of this in two different ways; the fingerprints turn black almost immediately? Even though you've carefully wiped the flute with a micro-fibre cloth right after playing. There's a kind of silver finish that some flute companies use that tarnishes from any acid in the skin. An experienced flute repair technician will find you the name of this silver. Then check with the Emerson company and find out whether that's the kind of silver your model uses. If so, then return the flute if you can't stand the look of the tarnish on the exterior. 99% of flute companies do not use this grade of silver for this reason; Emerson must have had a reason for using it. c) people who were born with the disease called Cystic Fibrosis (which makes salt come out of the skin's pores). If you are not using any chemicals or products on your hands, then it's more likely it's the flute, not CF. ha ha. So check on the name of that kind of silver; it might be something called "coin silver"? I'll look it up as well. There is no type of silver that tarnishes easier only one that is tarnish resistant, Argentium. Some Germanium is added to the remaining 7.5% of the Sterling Silver alloy. As for increased ability to tarnish...It is always a case of sulfur compunds in the air or touch, (from sources you have cited as well as others), but also is dependent on the air space in the grain structure. One reason that some people don't like tarnished removed is because removing the tarnish leaves more surface exposure for this to reoccur. So a good tarnish preventative after cleaning is always recommended. Plating is not immune and in some case more probable. Burnishing is a way to compress the surface grain structure to retard tarnish formation because it smooths and compresses the surface leaving less surface expose to air and in essence reducing the chance of sulfur compounds adhering to the surface and causing more tarnish. Coin silver has less silver in it and less prone to tarnish (by a small degree). If it is a body chemistry problem, it usually hits as students hit adolescence and can continue for a good decade. You can get nasty tarnsih just from touch through these years. Thankyou Joe B. for these wise words. I have had my flute for about a year and a half now, and I have never had it cleaned professionally. I don't think I can afford to get it done though. What should I do? Is there a way I can do it by myself at home without buying anything too expensive? It depends on what you mean by "clean". If you leave the flute for more than 2 years without being oiled and maintained, it wrecks the flute, slowly but surely. If you try and "clean" it with silver polish, you wreck the pads. A yearly "clean, oil, and adjust" can be done for under $50 if all you need is a little spot-cleaning, oiling of the moving parts, and a pad-check. If you don't do these necessary tiny adjustments and oilings, it doesn't matter how "clean" the flute is; it will start to leak and be harder to play. All the instructions for what you can do at home (using Q-tip and alcohol to clean dried saliva from inside the blow hole, very gently) is listed in the above article, along with fingerprint cleaning, and general care. But, like fixing your own car, if you don't have any skills in cleaning, oiling and adjusting all the tiny moving parts on your flute, leave it to the professionals. And if you leave it for four years or more, you'll pay triple that to get the flute in tip top working condition. Hey, a friend of mine just got a new old flute that used to be her aunt's for this school year. It's really rusty and old and neither of us have enough money to take it in. We were trying to figure out how to get the rusty color off, but all we found that could get it off was mouthpiece cleaner and it was m band teacher's. We don't have our own. What should we do? I think that many people don't understand that an old flute will have leaking pads. Leaking pads cause the flutist to have to use un-even and intense finger-pressure. This leads to all sorts of difficulties in learning to play the flute. As a flute teacher I see this all the time; students coming in with flutes that simply won't play properly. - extreme frustration because they cannot play quickly or fluidly. You don't notice all these things unless you're a flute teacher, and you see it every year in new students playing un-serviced flutes. What you should do is take it to a reputable technician. If you don't have the money, RAISE the money. Hold a garage sale, do some snow-shovelling, lawn-mowing, dog-walking, sell something that you never use. You need to raise about $150 dollars, that's all. Otherwise you will go through this frustration in stages, and or give up because a year from now you'll say "the flute was just too hard for me" when in fact the problem was caused by the flute not being properly serviced. It's like driving a car with an over-heating engine, that drips oil, and finally doesn't work at all. Not safe, not smart, and you will look back and say: "I should have followed the manufacturer's repair schedule." I've seen your situation hundreds of times, and it doesn't improve by home-cleaning. Cleaning it at home only makes things worse. Good luck raising the money. I am doing a science fair project on the best way to clean your flute. I read the things that you wrote about me cleaning it with acohol. I decided to clean it with a mouthpiece cleaner, is that ok? I also wonder if that is ok if I don't clean my flute after I use it evry day, is that ok? DO I also have to clean the open hole's on my flute because don't do that. My dad cleaned my flute with a ring cleaner and made it shiny when I bought it and I bought it used too! Thank you so much for your time!!!! If you use any chemicals on your flute you risk upsetting the fine balance between all these low-tech components. That's why flute players should avoid trying to clean their own flutes with chemicals. It is not expensive to have the flute cleaned up when you take it in for its annual "Clean, Oil and Adjust" at a flute technician's shop. Some flutists wipe off their fingerprints after playing, especially if they have fingerprints that leave dark marks, but for the most part, you don't need to clean the body of the flute; you leave that to the professionals who take the keys off before they try and clean any tarnish, gunk, or fibers that have built up in the fine mechanism. Leave all that to the professionals. If you need to clean out dead skin or gunk from the blow hole of the flute with a q-tip and rubbing alchohol, that is also an annual event. But I would not use alchohol to clean the open-holed keys as it could de-shellac the glue that holds the pads in, and could also seep into the delicate membranes of the pads themselves. If you read the above article, it clearly states that cleaning be left to a trained professional. Flute players who play flute for a living do not clean their own instruments, except to wipe off a few fingerprints, wipe the gunk off the lip plate (with a microfibre cloth) and to swab out condensation. All else is left to flute technicians who can inspect the flute, clean and fix what's needed, and return it to the player, safely maintained. Tell your Dad that "ring cleaner" being used on the open holes might cause pad failure. Pad leaks caused by chemical breakdown of the natural pad membranes (fish-skin/gold-beater's skin etc.) cause the flutist to have to force the keys closed, because the pad-leak becomes gradually worse over time. After several months of forcing leaking pads closed the flutist can develop painful hand/arm strain and find that they can only play slowly, and not play quick tempo music anymore, due to the time and effort it takes for them to close any one leaking pad. When you take your flute to a trained flute technician, ask them how many pads had leaks or had chemical disintegration. I'll be curious to know. And notice, after a "clean oil and adjust" how much easier it is to play your flute. Dear Dina, It takes 5-7 years of daily practice, to learn the flute techniques to play professionally. That includes 1-3 hours of focused, goal-directed, specific flute techniques per day. It also includes at least 5-7 years of one hour lessons once a week, as well as participation in youth orchestras, chamber music, and solo performance opportunities. See: http://www.jennifercluff.com/college.htm for articles on college level flute playing. See: http://www.jennifercluff.com/intermed.htm for articles on practicing. Playing the flute well enough to be paid for it (professional means "paid to perform") basically takes ten years in the business to gain all the experience you need to feel easy in the role of an experienced performer. My flute is starting to tarnish and it's scaring me. I have a special silver polishing glove that came with my Geminhardt. Should I be using that regularly? Or is it best to leave it alone? Also, my flute teacher told me I could buy some Flitz or Maas. Did he give me horrible advice? Or should I look into buying one of these polishs? I would NOT, never, ever clean my flute with silver polish. The truly black areas are too hard to reach, and polish has to be 100% removed to avoid inadvertently travelling to the pads, which then make sticky noises. Leave all polishing to your flute technician who with Clean, Oil and Adjust your flute annually. Tarnish does no harm to a flute, and most professional flutists have tarnish on their flute. It is a musical instrument, not a piece of jewelry. The point of it is to keep it in good mechanical condition, not to whiten the silver. I want to clean my flute and make it shiny. Is there a way I can do that without going to the repair store? Bye! No, unfortunately, you cannot get a flute clean and shiny withou a professional flute technician taking all the keys and rods off. You can use a silver-polishing cloth on the headjoint once a year, if your annual repair visit is delayed, but there's no way to get tarnish off from between the keys without getting silver-polishing chemicals off-gassing onto the pads. It's very expensive to have pads replaced; that's why I don't recommend that people try to polish their instruments; it will end up costing you ten times more to have the pads replaced then the $30 it may have cost to have a technician clean and OIL it (oiling is even more important than tarnish removal). I just bought a Powell Signature Flute. It was delivered to me last Thursday and I immediately started playing. As I played, I noticed how the body was getting stained. It was getting tarnished a lot faster than it was supposed to, since it is all sterling silver. I tried cleaning it by rubbing it vigorously with the cleaning clothes, I also used the Yamaha Silver Polish (my last flute was a Yamaha 281) but it didn't work as I hoped it would. After asking a couple of flutists and reading your blog I concluded that maybe I have acidic skin and that's why the flute gets "black" so fast. I was wondering if there was something I could do to prevent this from happening. Do you think it would eventually affect the sound quality or something like that? There was a recent incident of this on one of the flute email groups. The flute's silver may have been mismanufactured. Take it back to the store or dealer, and exchange it for a replacement flute that doesn't have this problem. Your skin's acid would not only tarnish ONE single flute, if you had a chemistry/lotion change. It would tarnish all silver objects, or all flutes. Verify that this is the only flute that reacts in this way, and have it replaced. I have been playing flute for 7 years, and I recently got a new one in preparation for college. I regrettably didn't take good care of my first one since I was so young. However I am working very hard to take care of this one. I am having a problem cleaning my head joint after practicing. The moisture that builds up on the very inside (past the tone hole) isn't removed with my cleaning rod... Any tips? You can use a cotton hankerchief or cloth and the typical wooden (threaded like a needle/thread) cleaning rod, and wrap the cloth around the tip before cleaning the headjoint. You're probably using the fuzzy wire stick, right? Or are you threading a weighted end through the mouthpiece. Also, not recommended. Regular cleaning rod with cloth covering end to reach crown is fine. OR, I personally use a "Flute Flag" which is a suede strip glued to a flexible plastic handle and cleans the whole flute right to the crown without even having to take the flute apart. This is the "Flute Flag" by Roger Holman that is full length, and then unscrews into two parts to be stored when travelling. 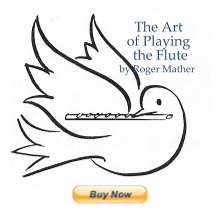 Just google "Flute Flag" or "Piccolo Flag" or "Roger Holman". If you take the flute to a knowledgable flute technician and ask them specifically to "clean, oil and adjust", they will do a full job on cleaning the silver that's under the rods and springs. The work consists of removing the full mechanism and cleaning and oiling it. Then the entire flute body is cleaned of tarnish. Then the mechanism is reassembled with added corks, felts, replaced pads or shimmed pads. The full cleaning is always performed when asked for. My question is not exactly about how to clean a flute, but is it okay to play the flute with lotion or sunblock on my face? My flute keeps slipping down from my chin because of the lotion/sunblock. Also, is it normal for my chin area to get very sweaty when the room is hot? I constantly have to stop playing and wipe my chin because it gets so sweaty that my flute continues to slip down. In the summer, when it's over 80 degrees, flute player's chins do sweat. The easiest solution is to put a piece of brown paper packing tape on the flute's chin plate; to absorb the sweat. A paper self-stick label or paper postage stamp also work. They remove with water or isopropyl alcohol. But paper stick-on tape should last for about a week or even more, if the weather cools, or you sweat less. Fresh tape is easy to apply. Just don't let it hang into the blow hole at all; cut it to fit if too large. An alcohol wipe would also be useful to remove sunblock from your chin before you play. The headjoint for my flute is really hard to get in and out what can i use (besides corkgrease) to make it go in and out easier? - if the headjoint tenon(the insertion part) is visibly brass (dark yellow-brown), then corrosion can build up inside the socket that receives it. Using a tiny amount of "Brass cleaner" on the receiving socket can clean this. But make sure you wipe off every bit of it so it doesn't travel down the tube to hurt the pads. - if the headjoint tenon is silver, not brass, then a corner of a cloth with spit, or, if desperate, a tiny amount of silver polish can be used inside the receiving socket. Same thing; wipe it well so that no silver polish remains afterward. - if the headjoint tenon is "out of true", or slightly bent from mis-handling, it costs under $10 for a flute repair technician to straighten it professionally. If you haven't taken the flute in for a cleaning/repair visit for at least two years, then it's definitely something that should be fixed at the repair visit that you are planning now. (Flutes need repair once a year; not kidding about this.) It's best to have an expert fix it instead of using cleaning products. And most importantly, if the headjoint is so hard to move that you've been grasping the keys and rods to yank it out, then you may have already bent some of the flute's moving parts; so take it to repair right away. Bent parts lead to worse problems. I've had this yamaha 221 flute for almost three years and haven't once gotten it cleaned by a professional. I always clean it inside and out after I use it with the proper cloths. I don't think my flute needs professional attention... but i'd like to know your opinion and the price ranges they ask for. If the flute is 100% free of tarnish, fibres, and dirt/grit in the mechanism, then to oil it and check it over will cost under $50. If the flute has pet hair, grit, dirt, tarnish, and no oil left in the moving parts inside the mechanism it may cost more than that to disassemble, clean and oil and reassemble. If there are 100% good pads with no leaks then a checkup for pad leaks is likely under $25. If there are pad leaks then shimming and replacing pads cost by the hour. Repair technicians are between $40 per hr. and unlimited per hour depending on their expertise. If I had a clean, well-kept three year old Yamaha 200 flute, I would expect to pay between $50 and $90 for a "clean-oil-adjust". But if any pads need replacing, it's approx. $60 per pad additionally. Talk to your flute repair person; they will tell you their EXACT estimate, and you can then choose how much of the work you can currently afford. Some very poor students get the work done in stages. At my house we have two Geminhardt flutes. One has a gold color on the mouthpiece (which my sister will never let me use even though she never plays it anymore) and a plain silver one. We have had the gold one for i think 8 years and it has not rusted and the other for i think 6 years and it is rusting between the keys. A lot of the keys are sticking also. It is kind of hard to play and whenever I get the chance to play the gold one, it is incredibly easy. I have played flute for two years now and I am beginning the third. the silver one also has quite a bit of fingerprints on it. Neither have EVER been for a "checkup". Does it need to be checked? EVERY FLUTE IN THE WORLD needs to be checked. - pads under the keys deform over time as they are wet-dry treated by the moisture caused by playing the flute. This leads to pad leaks, and pad leaks lead to fuzzy tone and hand clenching. Flutists who overcome fuzzy tone on certain notes by (unconsciously) pressing keys harder are actually ruining their ability to play quickly, while their pads are deteriorating. - If you take EVERY FLUTE IN THE WORLD to a reputable technician once a year, it will cost very little to upkeep the flute in prime working condition. If you wait three years or more it will be more expensive and the damage will be more extensive. Flutes are the most delicate mechanism of any woodwind instrument because of the pads, pins, corks, felts, lacquers, glues and paper shims they use. They require consistent annual maintenance or else both the player, and the instrument become more and more difficult to work with. I'm really enjoying reading your blog! I've been a flutist for 14 years and recently became an instrument repair technician. I've been working (after a 9 month certification) for a little over 6 months and thought I'd add a bit of info. from a repair person's point of view. This page is great and you've got great information. However, on student flutes (non-straubinger pads) pads don't cost $60 a piece! At our shop it's $12 a pad, and less for the trill and upper C pads. Your estimates for a C.O.A. are pretty on par with what we charge, but the amount varies greatly (from $65 to $200, I think) depending on the level of the instrument, B-foot, type of pads, etc. Just thought I'd share this info with you and your readers. The price of repairs vary SO MUCH from area to area, I thought this might be a helpful point to make! Thanks for the opportunity to clarify: I meant $60 per new pad installed, including labour. Interesting that pricing remains similar across N.A. We charge $12 for the pad and the labor combined, not just for the pad! And I believe we charge $25 for a Straubinger (pad plus install). So I'd say that the price does vary quite a bit! Thanks Katie for the input. I always assumed that the labour for shimming the new pad was at least 30-40 minutes work. Would it be rusting or tarnish ? Tarnish starts as a goldish-brown colour. A flute repair technician can verify whether the silver plating is coming off, but I doubt this is the case. Check your headjoint's tenon (the end that inserts into the body). If the tenon is brass, that means your flute is silver plated. It's unlikely that the silver is coming off just after two weeks. It's more likely tarnish; but, as I say, a flute technician will tell you. If it's a brand new flute and the plating is coming off, then it's mismanufactured and should be returned to the seller for refund. My keys make sticking noises. Do I just take a piece of paper between them or what? You can blot sticky pads with gumless cigarette papers or roller-papers from a hair-dresser-supply. These are lint-free papers that absorb condensation. But do so very very carefully (don't pull paper out from a depressed pad or you'll abrade the pad surface). The mouthpiece of my flute is brown where my lip goes is that normal? You can send a photo to jen@jennifercluff.com and I'll take a look, or you can take the flute to a flute teacher or flute repair person and ask what they see. If it is tarnish, it is easily removed with a cloth that that has silver polish in it, but let the repair person or flute teacher do that. I have a gemeinhardt flute and i have a gold lip plate. I'm scared if it gets tarnished so how can I prevent that? Tarnish doesn't happen to gold. Tarnish only happens when sulfur in the air reacts to silver. Thanks for the tips... I have a Yamaha solid silver head. It has black marks on the headjoint, and it doesn't come off with rubbing alcohol. What can I do to get it off? "A chemically treated flute polishing cloth (made to remove tarnish) is to be used minimally; once a year at most." These cloths have an inner and outer layer. Inner layer has chemical tarnish removers impregnated into the cloth. If used primarily on the headjoint it's fairly safe, as long as you remove all chemical residue and don't get carried away (if you rub too hard you're actually removing layers of silver, so be judicious. )Don't use it on the flute's body as body tarnish is better removed by the technician during an annual cleaning so as to avoid getting chemicals on the pads. I just got a very old Artley flute. There seems to be a little bit of mold on it....The whole flute is covered in marks. I don't know how to clean it. Can you please help me!? You need to have it professionally cleaned by a flute repair technician. YOu cannot adequately remove mold yourself, and a flute needs to be dissassembled to be cleaned thoroughly. Also the technician will be able to check the condition of the pads (under the keys) to assure you that they are sealing. Often moldy flutes need re-padding as well as a new case. But the flute repair person will advise you on all this. Good luck. I've had my flute for 4 years and it has a gold plated mouthpiece. Just this past year, it has been leaving a black/grey mark under my bottom lip (where my flute sits when I play). Could it be the way the metal is on the face makeup I wear or is it just the flute itself? What can I do to stop it? Gold is not supposed to react to skin oils or makeup, but the gold plating could be wearing off, I guess. Silver and other metals react to some types of makeup and skin products in some people, turning their skin black. Try cleaning your chin with alcohol (rubbing alcohol) and the chin plate of the flute before you play and see if the black marks stop. is there any way to clean a flute case?? mine is getting a little bit green/brown in the areas where my flute sits. anything i can do? The green-brown might just be oxydation from the brass of the flute's headjoint tenon. If there's any way to clean it with some chemical fabric cleaner, they'll know at the repair shop. Personally, I'd just leave it. Hi, I am worried that I may need to get a new cork for my flute. It is turning green, and it is coming out of the head joint really easily. I dont even try, it just pops out. Do I need a new one? Don't worry dear Anonymous. A new headjoint cork is less than $10 and that's installed! You'll suddenly find that your flute plays thousands of times more easily. The fact that your cork has gotten this bad means that you haven't taken your flute for an annual clean-oil-&-adjust. Are you trying to play the same flute for five years at a time without ever getting its annual maintenance? Imagine what would happen to a car, if people did just that. Flutes have their headjoint corks tested for leaks, shrinkage, and saturation each time the repair person tests the flute for repair needs. Corks last up to ten years, if the flute is well maintained. So you're long overdue for a new cork, and may find that you also have other repair needs after all this time. Don't delay. Take it in. I have been playing my flute for over 10 years. However, since I started university last September I stopped playing. I have now noticed speckles near the pads and now I am sad that I haven't played for so long. Is this normal, and is there any way to get rid of them? Do you mean there are speckles on the silver? (near the pads)? That is normal. It is just tarnish. When you're ready to play again, send the flute to a technician for a "Clean, Oil and Adjust". It should be a quick fix and they will remove tarnish when they clean it. A silver polishing cloth will also take off light tarnish, but I don't advise it. After more years of playing than I care to enumerate, and having resorted to alcohol swabs, postage stamps, sticky edges of envelopes and brown paper packaging tape, I finally realized that I could solve the problem of a slippery chin in hot, humid summer weather by applying a small amount of anti-perspirant, letting it sit for a few minutes, then washing it off. It doesn't seem to take more than a short exposure to the anti-perspirant to have enough absorbed by the skin to reduce or stop the over-production of sweat and the lip plate slipping. Today I played a service in our old and old-fashioned United Church here in London, Ontario, as in NO air conditioning whatsoever, and, lo and behold, NO SLIPPAGE. So much easier! I suspect that any anti-perspirant well tolerated for its original purpose will not cause skin irritation on the chin and,by washing it off after giving the active ingredients a little time to be absorbed, the flute will not suffer any ill effects, either. Has anyone else tried this and not shared their secret? And, Jen, thanks for your excellent writing on this site. What about your flute sticking at the places they go together? Do you use oil? When you slide the flute sections together the tenons slide into sockets. If the tenons or sockets are bent, gritty, tarnished or have a tarnish or gunk buildup, they get harder and harder to smoothly slide together. They need to be cleaned. Try spit and a cotton rag. Wrap the rag around your finger and clean the inside of the socket. That's probably where most of the gunk and tarnish is built up. If cleaning the sockets with spit doesn't work well enough, you can take the flute to a technician who will clean and true the tenons and sockets for under $20. You should do this, especially if they are bent, dirty or gritty. If you were to oil them the oil would attract grit (and leave oil in your case on the fabric too, where it can spread to other parts of the flute.). If you attract grit to the sockets and tenons, the grit will score the metal. That's why you don't grease flute tenons and sockets. Grease is only used on CORK. Hi I just got my flute and and I've barely played it at all and all of a sudden there's little black blobs inside my flute what do I do?!?!?!?! Hi Savannah, Are the black blobs just water droplets? Because they are inside a tube, they might look dark, but they are just condensation. Or are they tarnish marks? Maybe you ate egg salad right before you played, and the sulfur in your breath made the water droplets leave black circular marks? The inside of my flute is pure black, even though the outside is shiny white silver. This is just because of normal use and normal tarnish. If you think yours is ABnormal, then show it to your flute teacher and ask them. Or show it to a flute technician or other flute player...they will likely recognize it. They feel all most like glue. They're very gooey and sticky. I don't eat before I play either. Thanks for all and any help. If you bought a new flute, and these sticky black blobs are appearing inside, then I would take it back to the store I bought it from and ask that they be cleaned out. Alternately, if they persist, or worsen, tell the store you want a replacement flute. This does not sound normal. My flute smells bad what can I do at home. P.S I am only 11 and don't get a allowance . Dear 11 year old with no allowance. "My flute smells bad when I get home". Is it because it's a school flute made of brass inside? If so, ask your band teacher if there's another flute to borrow. Your smelly flute needs a professional cleaning (at a flute repair shop). If the band teacher doesn't have a budget to get it cleaned, and your parents can't afford to get it cleaned, and you can't afford to get it cleaned, then you'll have to mow lawns, shovel snow, wash cars or baby sit until you have $50 and then you take it to the flute repair shop and ask them to get rid of the bad smell. You can use isopropyl alcohol to clean off sticky fingerprints, or guck from around the lip plate, but it won't take off tarnish. It's okay for sterilizing a headjoint between different players, but it's not good for the cotton pads under the keys. I just started playing flute, and I have a very old one, and I need to clean it. I don't have a cloth though, so how do I clean it? do I give it a bath? Here's what will happen if you give it a bath. 2. The glue that holds the pads in the keycups will be affected. 3. The pads will swell, puff up, and rip their surfaces. The number one thing that you do not do is give it a bath. Take it to a flute repair person and ask for an estimate for a "clean, oil and adjust". My band was playing the 1812 Overture with canons recently, and the wind blew the ashes from the canons right back at us. The next day I found that my flute had marks over it. Is there any way to get the marks off? polishing it doesn't seem to have any effect. Just take the flute to the flute repair person in your area. They will clean the marks off for about $5. You have to communicate with more clarity if you want the true answer. You say "I have (been)sick for a few days". But does that mean that you have put "germs" in a flute that you have to return to the school because someone else is sharing your flute? Or does that mean you were away from school, and when you got back your band teacher was mad at you so they think that cleaning your flute is a good discipline? Does it mean that you had a communicable disease (like mono) and everyone else who shares your flute doesn't need to get mono? No one gives baths to flutes. No one. If that's what your band teacher thinks happens, then they know very very very very little about flutes. Buy isopropyl alcohol from the drugstore ($3). Pour in a tiny amount of alcohol and swish it around in the headjoint. That's it. Takes five seconds. Honestly. Silver is anti-bacterial. Except for possible goo-buildup inside the part that you blow, (right inside the blowing part of the headjoint) the other germs are already dead. If you're really worried that your fingers were covered with germs, just don't touch the flute for 24 hrs; or gently wipe off the keytops with a micro-fibre cloth. That's it. Anything else is total over-kill. Freaked right out by this; maybe you heard wrong. Go ask to make sure. More on Can I give a Flute a bath? Flute technicians at the above site are telling a novice band director that trying to bath a flute is like driving your car into the ocean and submerging it. The upholstery gets ruined. The engine gets ruined. Very appropriate example. Hi, so I'm a flute player and I have an old flute that I used about 3 years ago. I haven't used it in a while and there is tarnish all over it. I heard you can use toothpaste to get it off. Should I try it or not? No. I wouldn't do this. Dear Jen, I was in the middle of putting my flute together and I notice that in my head joint(only in the head joint,) there was some green stuff inside. I tried to clean it off with a rag I have but it didn't change a thing. Is there anyway to get the green out of the inside and what is the green stuff? I'm not sure what "green stuff" it might be; but perhaps it is copper oxidizing. Brass creates a green crud when it oxidizes, and so does copper. If your flute has either in the lining of the headjoint, then perhaps it is that. Personally, I would just wait until the flute goes to the shop for the annual clean-oil-and-adjust. The technician will clean that green stuff out in about five seconds. I have a flute with a headjoint that is solid silver. Normally I just use rubbing alcohol to clean my flute, but I thought I might try out a mouthpiece spray instead. Do you think it is okay use the spray on my headjoint to clean it, or will that harm the flute? Hi, I've never heard of "mouthpiece spray". What's in it? Is it just alcohol? I cleaned inside my entire flute with a chemically treated cloth (without knowing it's treated), and now my flute is no longer shiny inside. This seems to affect the sound. Is there anything I can do to fix it? My flute is solid silver. It is copper oxidizing indeed. And having the headjoint green makes a HUGE impact on the sound. The green stuff is rough, and tends to absorb the air stream you're blowing. As a result, you get a very dull sound. Thank you for answering all these questions correctly! Is there no flute repair person where you live? Why are you trying to clean such a corroded flute? Can't you just get the real flute repair person in town to do it? Is it ok if my flute head crown has rust? It's new, but it had rust in it. Would you tell me if it's ok? Sorry for the delay; I have comments set to "approval." No, you cannot clean a flute this way. Why? The pads of the flute are not meant to be made wet.